Speaking of overdraft fees, that’s where banks getcha. “Some banks — mostly smaller ones — will reorder your transactions from highest amount to lowest, instead of chronologically,” says Nick Clements, co-founder of the financial website MagnifyMoney. “This lets them charge multiple overdraft fees. There’s still a considerable percentage of the industry that does this.” Of course, that’s highly unethical — stacking the deck in favor of the bank. But in the absence of regulation, this is what happens. 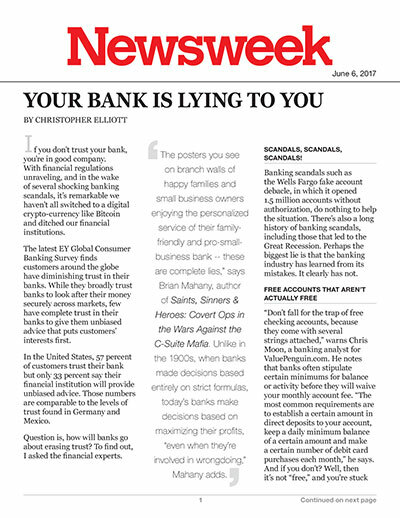 “The posters you see on branch walls of happy families and small business owners enjoying the personalized service of their family-friendly and pro-small-business bank — these are complete lies,” says Brian Mahany, author of Saints, Sinners &amp; Heroes: Covert Ops in the Wars Against the C-Suite Mafia. Unlike in the 1900s, when banks made decisions based entirely on strict formulas, today’s banks make decisions based on maximizing their profits, “even when they’re involved in wrongdoing,” Mahany adds. I know what you’re thinking — there ought to be a law! Problem is, when you rein in overdraft shenanigans, protection rackets, “free” accounts and clamp down on the scandals du jour, banks will always find a way around it. It’s not to say regulations are unwarranted, only that the banks will probably be a step ahead of the law.